Throughout this short little series on setting business goals, I’ve mentioned the importance of writing said goals down. That isn’t just because it’s easy to forget. There’s a lot more to it and there are some very important reasons why you have to write them down. I thought in today’s blog post, I’d share my thoughts on this and hopefully inspire you to write down your own goals going forward. By the way, this works for any type of goal, not just the business ones. The simple act of setting a goal, even if it’s just in your mind, doubles your chances of success. That’s a pretty big deal in itself, isn’t it? If you take it a step further, and actually write those goals down, you’re 10 times as likely to succeed. Read that last line again please. That’s right…you can increase your chances of making it by 1,000%. That’s mind-blowing! There are a few different mental and psychological processes going on here that start to give us a glimpse into why it is so important and effective to write our goals down. The first is that it’s a lot easier to remember something that we’ve written down. You’ve experienced this first hand with your grocery list. When you make a mental list of 10 or 15 things, you’re likely to forget about half of them when you get to the store. If you write out the list on the other hand, and then end up forgetting it on the counter, you will probably remember most of the items you needed. This is explained through the fact that information has to be moved from one area of the brain to another to turn it from thoughts into written words on a page. A process called encoding is also involved. All of this helps you retain and store the information better. It’s the reason we’re asked to take notes during lectures in college. Last but not least, when you write down your goals, you have something you can review regularly. This adds another layer of cognitive processing and increases your chances of success even further. Sadly, only a very small percentage of people make the time to regularly review and evaluate their goals. The ones that do are some of the most successful and highest achieving people out there. In other words, it’s something we should do as well. Write them down in as much detail as possible. Set aside some time to review them regularly. This could be weekly, or even daily. Give it a try for this coming quarter. Set yourself a goal. Be specific. This could be something like finally creating that first paid product or adding an extra $500 to your bottom line. Decide by when you’ll reach your goal and how you plan to get there. Write it all down and look at it every morning. This will help you stay on track and make time in your busy day to work on making progress towards your goal. 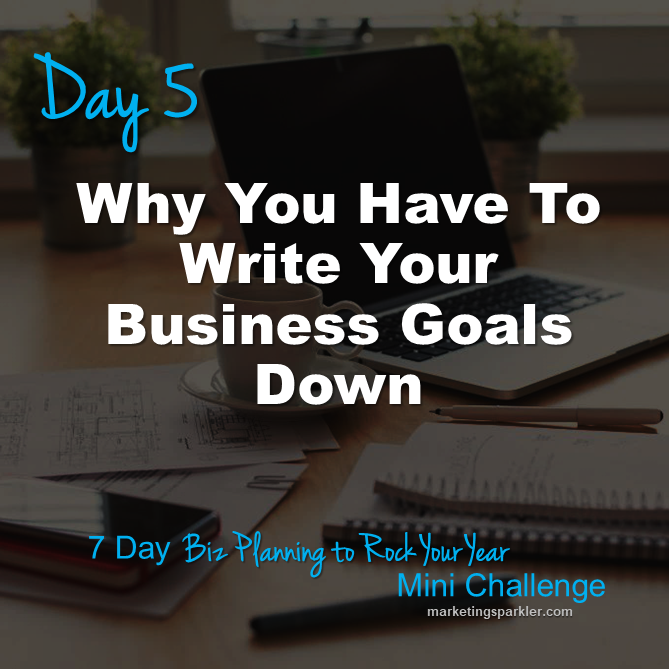 This post is Day 5 in the 7 Days of Biz Planning to Rock Your Year Mini Challenge, a free, 7-day series for entrepreneurs that can be started at any time. Register and each day you’ll get an email from me with tip or a strategy designed to help you make plans for growing your business. We’re not talking fluff-n-stuff here. These are hands-on, actionable tips and strategies you can use every day to embrace planning, set ambitious goals, and then work towards reaching them. Click here to sign up for the full challenge.